There is nothing quite like the scratchy sound of a vinyl record to get the creative juices flowing. Well... beer and wine also help with that. DJ and founder of the all-girl Chulita Vinyl Club Claudina Saenz collects records like they were 45 rpm memories. She deploys them strategically to provide her listeners with direct portals to feelings and emotions that may have not been stirred for some time. Reminisce and enjoy a glass while Saenz spins brown-eyed soul and Tejano music while hanging out with friends. 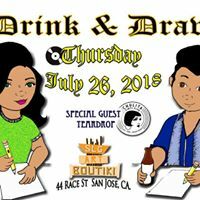 As usual, creativity is encouraged: Art supplies and games will be provided by Art Boutiki.